Look at the Classes tab for What's Happening in May!!! Amara (handi quilter machine) set up in the shop to quilt on, Come & see this great machine. Sweet Sixteen sit down & Amara Longarm quilter available for you to quilt. Take a class to quilt & then sign up to quilt your quilts by the hour in the shop. ​Have Leader Grips available for your quilter frame---You will never PIN another quilt. Save many hours to prepare to quilt!!! ​Come to the shop to see how easy they are. See the Class tab for all the classes planned. T-SHIRT / MEMORY QUILTS----Taking orders for T-Shirt Quilts, Bring your bag of T-Shirts, I will make a memory quilt for you to cherish. You can customize your quilt-----SIZE, FABRIC, STYLE, Can show you pictures of Quilts I have made to give you ideas of how you want your memory quilt made. ​Longarm quilting - If you need that quilt finished. Bring to the shop!! 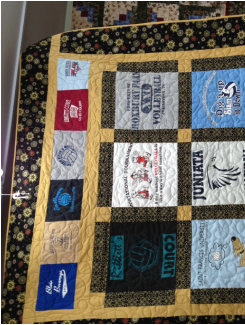 Making T-Shirt Quilts, bring those T-Shirts that are in your dresser, not worn & make a memory Quilt. Customized Quilts made with long arm quilted. You choose the design, fabric color & size of quilt you want, Call & discuss, have many ideas to choose from other quilts that have been made. 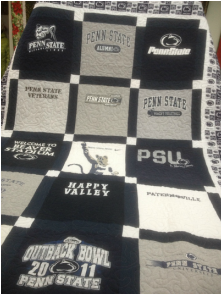 A quilt that will be cherished, great gift for someone, that they won't expect.